Thanks @xfire_ATX . . . no clue if crew familar with a HUE product, but I clicked the link and I like what it offers. Looks like it doesnt ship until October? Our project will be done early Sept . .
You dont need work crew for it just have them leave you a plug then you put it in. Works with same lamps you can have inside. Someone always has a bigger boat. @THEBuckeye for sure, not playing that game !! So you are in New Albany huh? 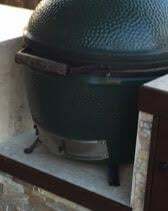 My best friend since diapers moved to New Albany last yr, right next to the Owner of HOGGIES BBQs house . . they have been playing around on his BGE trying brisket different ways - I am jealous. GO BUCKS. @Theophan thanks for the post !! The top will have rounded overhang, and down below we have a foot rest too . . I thought same thing when I first saw, but the video CAD he presented shows much more detail - thanks! QUESTION: best way to rest the egg on stone? Is it using the original ceramic feet? Or just flat flush on stone? Or I saved picture here that shows someone using small "nest like" legs? see pic - thanks in advance. One suggestion, though, about those chairs lined up at the cook area: In any bar, restaurant, etc., the counter where the people sit will hang over the sitting area, so the people's knees go under the counter, and they can sit right up "at" the counter. In your design, it looks like there's no overhang. If you try sitting at a table with your knees NOT under the table, you'll see that you're too far away from the table to be comfortable. You can't lean on the table/counter, you have to reach way forward to put something down or pick it up. If you want people to sit there like sitting at a bar or a counter, I'd strongly suggest making a way for the counter to extend toward the chairs, so people sitting there can get their knees under the counter and be closer to the counter. Otherwise, WOW, it all looks fantastic! ^^^ This right here, very important, if you are asking opinions. I should have read page 2 before posting. I see now you already have this planned. @AlbertaEgger wellllll we have a 2" nose that will come out . . but I am worried as this does not provide enough overhang to sit with knees under. 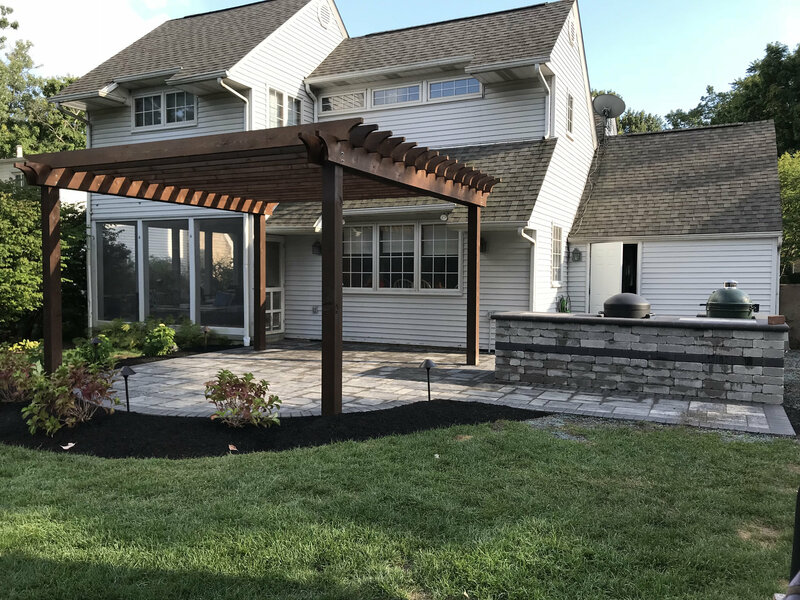 I do not have the budget now for GRANITE, but that seems like the answer as I could do a large slab and have a good 4-5"+ overhang, to really feel like a bar. I am thinking this might be phase 2 of the project in a few years (remove stone top and add granite) . . . very smart suggestion, wish I could pull it off now but this project includes new trees, landscape, screens, etc so Im outta cash - thanks. Might be cheaper alternatives to the granite to replace the stone. I am not sure what type of stone you are using for the top, but an option would also be to use some larger flat stone around the edges with some supports. the larger stones that would be used would not be cheap either. Looks like you have a fairly large project going, that's a lot of work to do and be completed then wishing it had the overhang. I think 8.5"-10" is the minimum overhang one would want. Either way, looks like it will be a great place to hang out. Look forward to seeing the end results. UPDATE FYI: looks like this product is called " BGE Table Nest " and I assume it is more stable than ceramic feet. Yeah, you def want a table nest for your setup. I'd also just put a larger top surface all together. This would add the overhang for true bar seating, and would prevent the possibility of the egg tipping or being knocked backwards off the island. Prob would never happen, but I also think its a more finished look when the egg fits into a nook on the island than a notch... if that makes sense. Just my 2c. if its sitting on all stone no need for a table nest unless its wood structure underneath then I would get one. it will make it less stable so if you can get way from it I would. any pictures of updates? You will definitely want a table nest!!!!! 2 cents. don't put a cooking device in the middle of your serving bar. Put both devices off on the wing. Cooking devices radiate heat and nobody wants to sit next to one. Use the bar for serving and entertainment. LBGE, SBGE, Mini-Max, 1995 BGE Chiminea, 22" Blackstone, Weber Genesis E-310.